Just the other day, a colleague, during an annual health check-up received an obesity diagnosis due to his high Body Mass Index (BMI). What exactly is the BMI? 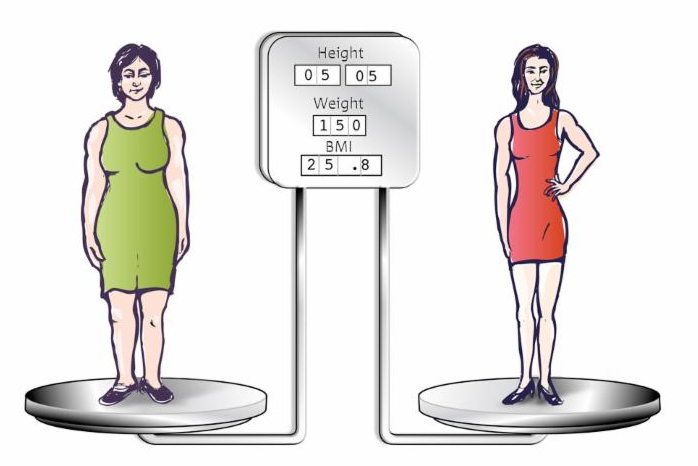 The BMI is an attempt to quantify the amount of tissue mass (muscle, fat, and bone) in an individual, and then categorize that person as underweight, average weight, overweight, or obese based on that value. BMI readings under 18.5 mean you are underweight. If you fall between 18.5 and 24.9, you’re considered normal, 25.0 – 29.9 qualifies as overweight, while a BMI of 30 or higher qualifies as obese. Statistically, as your BMI increases, so does your risk of developing weight-related illnesses, such as cardiovascular disease, type 2 diabetes, and certain cancers. In recent years, more researchers and health care providers (yours truly included) have challenged the accuracy of the BMI in measuring body weight. The BMI does not distinguish between the various types of tissue within a person’s body. Muscle tissue tends to be heavier and can tip more toned individuals into overweight status, even if their fat levels are low. My friend, diagnosed as obese has a husky build and could benefit from a reduction in his midsection, but subjectively, he would not be considered “obese.” I am 6 foot 7 inches tall, 245 lbs, and have a BMI of 28.9, placing me 2 points shy of an obese diagnosis as well. This calculation fails to take into account that I lift weights 5-6 times per week and maintain a muscular build. An individual’s body fat percentage is a far more precise measurement of one’s fat content. The body fat percentage (fat mass/body weight) measures what portion of your body is adipose tissue and thus provides a more accurate predictor of one’s risk for a weight-related chronic disease. Let’s say two women are the same height and weight: Kenya and Sharon. Kenya and Sharon are both 5 foot 4 inches and 140 lbs, which mean that they both have a BMI of 24. Kenya doesn’t work out and eats junk food. She controls her portion sizes, which keeps her scale weight down. Kenya has 42 lbs. of fat and 98 lbs. of lean mass giving her a body fat percentage of 30 percent. Sharon does weight training and cardio three days per week and eats a healthy diet. Sharon’s frame posses 28 lbs. of fat and 112 pounds of lean mass giving here a body fat percentage of 20 percent body fat. Even though Kenya and Sharon both have the same BMI, they have drastically different looking bodies, and that’s reflected in their body fat percentages. Of Kenya or Sharon, who do you think is at higher risk for the development of cardiovascular disease, type 2 diabetes, and other weight-related diseases? Below are some general reference ranges that health care providers use with body fat percentages. For women, 10 to 12 percent is essential fat; 14 to 20 percent is in the athlete category; 21 to 24 percent is fit; 25 to 31 percent is acceptable, and 32 percent or more is obese. For men, 2 to 4 percent is essential fat; 6 to 13 percent is in the athlete category; 14 to 17 percent is fit; 18 to 25 percent is acceptable, and 25 percent or more is obese. As a physician in clinical practice, I understand the use of BMI despite its shortcomings. It is a general measure of risk that is easy to calculate and can give great clinical insight. However, it fails to paint a holistic clinical picture. As often as possible, I encourage patients to use their body fat percentages as one of their general metrics for optimal health. Contact Dr. Boyce today for a free consultation about his 21-day fat loss program that will both jumpstart your metabolism and decrease your Body fat percentage!! Weight Loss, It’s more than exercise!